If we asked you to name something spooky about cats, you’d probably mention a black cat crossing your path leading to misfortune. But a bit of bad luck pales in comparison to some of the terrifying myths of times past. Cats are undeniably mysterious. There’s just something about those haunting eyes, their silent, stealthy movements and a wail that reminds some of babies crying. Whatever the cause, that air of mystery has lead humans over the course of human history to entertain a whole host of seriously scary - or even downright strange - beliefs involving felines. Honestly, it would be easy to fill a book’s worth of information of this topic, but we’ve culled that down to a manageable list of five. After reading these decidedly spooky superstitions, you’ll feel like the scaredy cat. But don’t worry, your sweet kitty will be there to comfort you. A fairy creature from both Celtic and Scottish mythology, Sith Cats were large black cats with splash of white fur on its chest. While Sith Cats were believed to be spectral in nature, they were inspired by actual creatures known as Kellas cats, a hybrid between wildcats and domestic cats only found in Scotland. They were believed to have wicked purposes, including a desire to consume souls immediately after death. Every year on Samhain (which we now celebrate as Halloween), houses where an offering of a saucer of milk was left outside would be blessed by the being, while those that did not would suffer a curse. Fun Fact: The Scots believed the Cat Sith was actually a witch that had the ability to transform into a cat, but that the witch was limited to only nine transformations in a lifetime. Scholars believe this is the origin of the belief that cats enjoy nine lives! First conceived in the oral traditions of southern France, the Matagot (also referred to as Mandagot) is a mischievous spirit. While it was capable of shapeshifting into a number of animals (such as a rat, a fox, a dog and even a cow), its preferred form was that of a black cat. Matagots were considered evil in nature, but they could be trapped whereupon it would take a largely beneficial role for its captor. The legend states that if you lured one from its hiding spot with a serving of fresh, meaty chicken and then scooped it up and walked straight home without looking behind you, it would become a source of dependable good fortune. There were a couple of catches, as there always are with magical beings. First, before every meal, you would have to feed the first mouthful of your food and the first sip of your drink to the Matagot. If you managed to stick to that routine, each morning you would find a gold coin. Second, you would have to release the creature from this servitude well prior to your death. Otherwise, your last days on earth would assuredly be agonizingly painful. The origin of this terrifying legend is from 16th century Japan. One of the more frightening creatures, this cat not only sought to devour humans, but immediately afterwards would assume their victim’s exact likeness, whereupon they would attempt to deceive other humans, thus continuing a vicious cycle. Aside from their shapeshifting abilities, they were believed to wear strange hats for dancing, perfectly imitate human speech, have the ability to place hexes on people (especially those who were known for their cruelty to cats), possession, and even a penchant for hiding in mountainous locales where they would tame and train wolves to assist them in attacking weary travelers far from home. Believed to originate among the Cherokee people, the mythical Wampus Cat is a common staple of Appalachian folklore. A shapeshifter, its most common manifestation was as a large, wild cat, but it could also take the shape of a beautiful woman. It was considered a ferocious creature, capable of driving even the bravest of warriors to the brink of insanity. J.K. Rowling’s fans may recognize this magical being as a source for the hair that Garrick Ollivander used in the creation of certain magic wands. Fun Fact: the word “catawampus,” which means “out of alignment” but also “fierce and destructive,” arises from this myth. Like all of the supernatural kitties, this Irish creature's origins began centuries ago. However, sightings have continued into modern times, which makes this arguably the most frightening. Like the tall tales that are common in the area, this one is attached to a particular great house. But we can assure you, nothing like this ever happened on Downton Abbey. Located in Dublin, the Killakee House was rumored to be haunted by a spectacularly creepy cat. Though technically it stalked the grounds, unlike other big cat sightings in the UK, the main difference is that this cat is supernatural. In 1968, a young couple bought the Killakee House and began much needed renovations. Within days, workers started hearing strange noises and sensing things that quite frankly were decidedly spooky. Things came to a head when the workers were shocked by the sudden appearance of a towering black cat with eyes that "glowed like a demon." Just as the renovators started freaking out, the specter vanished. Afterwards, the new owners listened politely to the story, but didn't put much stock in the tale. And then ... the creature appeared to each of the new owners in turn. The giant apparition appeared in every corner of the house, despite locked doors and windows, stalking the couple with its penetrating stare and toothy snarls. The newlyweds sought help from the Catholic Church, whereupon an exorcism was performed on the estate. For a few months, everything was quiet, and the two believed their nightmare was finally over. Sometime later, however, a group of actors visiting the estate held a séance, whereupon the devilish creature returned, bringing with it two frightening ghosts dressed in nuns' garb. And thus, the nightmare continues. We’re all familiar with the long and storied association between cats and mythology. It makes sense: they are mysterious creatures, well suited to legends and lore. But what about dogs? As man’s best friend, they fall into a bit more of a predictable and familiar category. Or do they? As much time as we spend with dogs, it makes sense that superstitions would crop up over time. While some are specific to a certain time or place, others are more universal. Where did these myths come from, and why? Read on to learn about five of the most unusual ideas and legends surrounding our canine companions! Origin: This is one of the most common dog superstitions, and can be found in multiple cultures. In Greek mythology, the howling of a dog was thought to signal that the Wind God had summoned death to a nearby home. In Norse mythology, dogs howl at the approach of Freyja, the Goddess of Death. Why? Because her chariot is pulled by two giant cats (think about it). In Welsh lore, the king of Annwn would patrol the land riding supernatural hounds that only other dogs could see. The howling was their way of acknowledging the presence of these spooky beasts as they raced by. Facts: Dogs howl as a form of communication. Sometimes it's for attention, other times it's an expression of anxiety, and sometimes it’s just a loud way of saying, “HELLOOOOOO." As a form of communication, it’s very effective! As a former coonhound owner, I can attest to the fact that baying carries over long distances. Remember, dogs are pack animals, much like their relatives, wolves, whose howl can be heard for many miles! Origin: If you’ve lived with a dog, you’ve probably had this hair-raising experience ... it’s pitch black outside. You’re home alone. In the eerie silence, your dog suddenly starts to stare at a wall (or worse, a door with no window) and starts to growl, hackles raised. Are they seeing the supernatural? Facts: Dogs do perceive the world differently than we do, but that’s hardly proof of the supernatural. From dog whistles that pick up high frequencies we cannot register to a sense of smell 10,000 more sensitive than our own, dogs enjoy a heightened experience of their environment beyond our capabilities. Out in the world, many people report dogs appearing agitated in the moments before earthquakes or other natural disasters. It is theorized dogs can pick up on sensitive vibrations we miss. People have taken advantage of these sensitivities to train dogs in everything from seizure alerts to cancer detection, proving that in almost every sense, dogs out-perceive the world compared to you and me. So what is your dog growling at in the dead of night? Let’s tell ourselves something comforting so we can fall asleep tonight. Origin: This one is specific to France, land of croissants, the Louvre, and lots and lots of dog poop. According to local lore, stepping in dog piles with your left foot is good luck, while stepping in it with your right? Woe be unto you! Fact: More than anything, this legend reflects that as a “scoop your poop” culture, France has a long way to go. A recent survey noted that while 1.85 million dog waste bags were sold in the UK in 2015, France sold a mere 3,600. That’s one fifth of one percent as many bags being sold, people. Until 2007, dog poop wasn’t even mentioned in French law at all. Mon dieu! I think no matter where you live we can all agree on one thing. Stepping in a warm pile of dog waste never feels lucky, regardless of the foot. Origin: An English myth contends that seeing three white dogs standing together is a sign of good fortune, particularly financial luck. An alternate version states the same good luck will come to you if you spot a Dalmatian (pun intended!) on the way to a business meeting. Fact: No one is quite sure where this came from. Maybe because these dogs were rare, it was more of a unique find to see them wandering the streets! Just as possible is the simple associations people make between white being a symbol of good luck and black a symbol of bad luck, an unfortunate fallacy that results in many wonderful black cats and dogs having a more difficult time getting adopted. As someone who adopted both a beautiful black Labrador and a sweet and wonderful black cat, I’m convinced they bring nothing but great fortune. Origin: Historically, nautical legend is filled with a wide variety of superstitions about who and what can come on board. It makes sense. Sailing is by nature a dangerous occupation, so every time something terrible would happen, it’s only natural to look for some external cause. Better to blame the flowers or bananas you brought on board than the terrible weather you had no control over. But why dogs? That, unfortunately, remains a mystery. You’d think those long, lonely days out on the open seas could only be improved with a happy companion. Maybe it was the fleas they brought as stowaways? Fact: Times have changed. Dogs are now considered faithful companions to many seafaring people. You can even get your dog his or her own lifejacket if you’re planning to bring him aboard. If you want any further proof about how much our views have evolved over time, consider this: cats on board ships used to be considered good luck, probably due to their ability to control the rodent population. Can you imagine taking today's average house cat out on the high seas? Yikes! If you ask me, having a dog in the house is good luck no matter what. According to my own personal legends and lore, dogs bring good health, happiness, and reduced stress to all they come across. That's a story I could tell again and again! Have you ever heard a dog-related superstition? Share it in the comments section below! Humans and dogs have been cohabitating for eons. In all that time, have we created a managerie of dog-orientied stories to scare and delight? Yes, yes we have! Here, Dr. V reveals five of the most unusual canine myths. 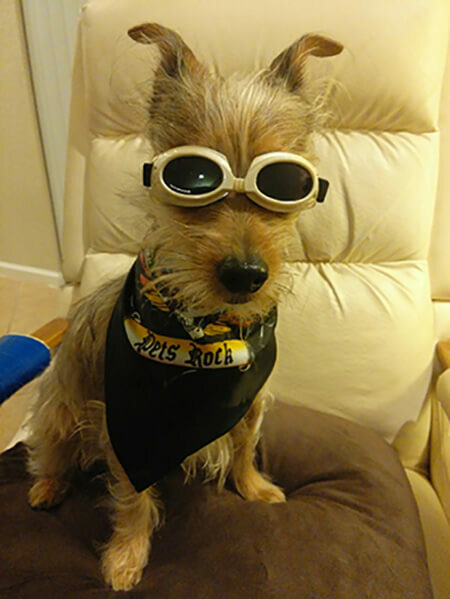 Earlier this week, we asked our readers to submit photos of their dogs and cats celebrating Halloween. So many of you responded and now we’re happy to share some of the spooky fun with you! Adorned in a flattering ensemble, Kinzie is rocking a look she calls ‘Candy Corn Witch’. No Halloween would be complete without a great pumpkin, and they don’t come any cuter or sweeter than Pumpkin Vasquez. 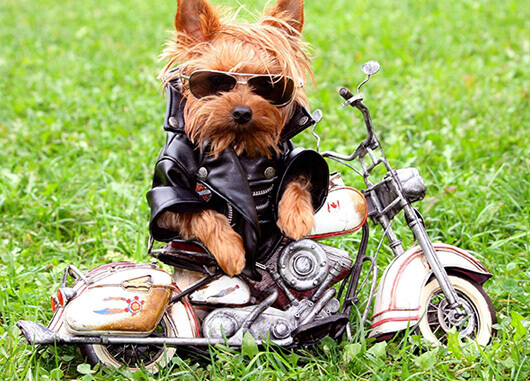 Oliver being totally chill and owning his role as Scary Biker Dude. By far, our most highbrow submission goes to the classically inclined Ludwig 'von Big Boy' Beethoven. Granny Zelda was caught wearing her unmentionables, saying, “I can’t talk now, my stories are on." Stella’s costume definitely raised some eyebrows. Is it a bird? A plane? Nope, it’s Copper doing an excellent imitation of Superman! Looks like this Kal-El is hangry. Well, Hello Kitty! We’d trade all of our Beanie Babies for a few minutes holding Buttercup. 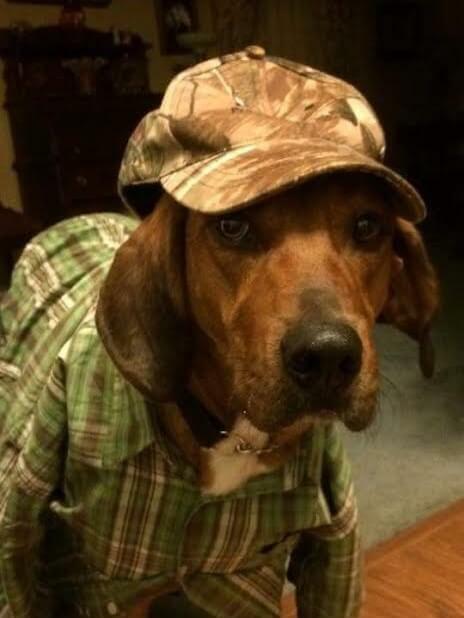 Even though he’s not from Baskervilles, this hound is definitely on the case. Now we just need to find him a suitable Watson! Simple, but always spooky, Wendell looks particularly ethereal in his ghostly garb. 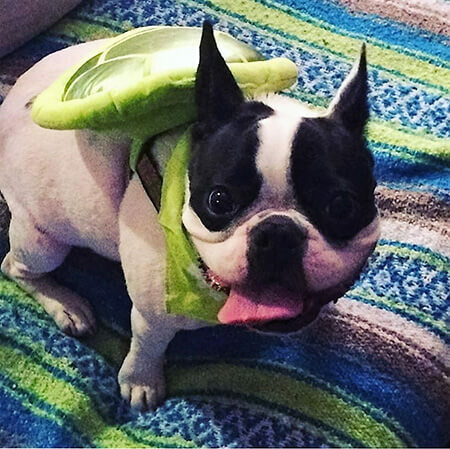 Slow and steady wins the race, says Luna, pulling off her turtle costume with aplomb. It’s barely November, but Coffee is already gearing up for Christmas! For all of you who sent evidence of just how awesome your companion animals are, we thank you from the bottom of our candy hearts! And to all of the dogs and cats who participated, we hope your bags were full of yummy, healthy treats! Just because Halloween is over, it doesn’t mean that your companion animals don’t deserve high quality treats all year ‘round! Be sure to check our big selection of dog treats and our gourmet cat treats. Keep in mind that we’re always interested when your pet kids do something cute, sweet or funny. Email your awesome pet photos to blogfun@lifesabundance.com. Dressing up for Halloween isn't just for humans anymore! If your dog or cat is donning a costume this year, we want you to share the adorable photographic evidence. Email your costume pics to blogfun@lifesabundance.com. Staff favorites will be posted the first week of November, so tell your four-footers to say "CHEESE!" Dressing up for Halloween isn't just for humans anymore! 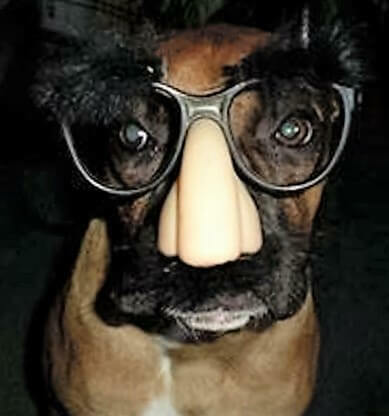 If your dog or cat is donning a costume this year, we want you to share the adorable photographic evidence. Happy Halloween! If you’re like many pet parents, you love celebrating howlidays with your companion animals. No matter how you get your All Hallows’ Eve groove on, it’s always a good idea to take some precautions to ensure that your pet kid stays purrfectly safe. 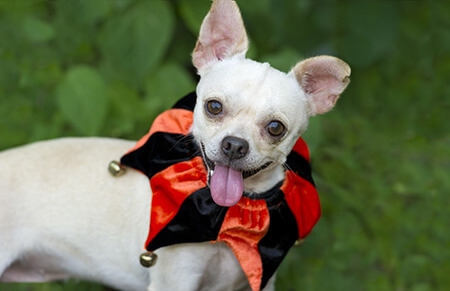 Halloween pet costumes are adorable and fun for people, but some costumes can stress out your dog or cat. Just because it’s for sale doesn’t mean it’s safe, as some pet apparel can be downright dangerous. Please, don't ever force your furry four-footer to wear a costume he or she obviously hates. 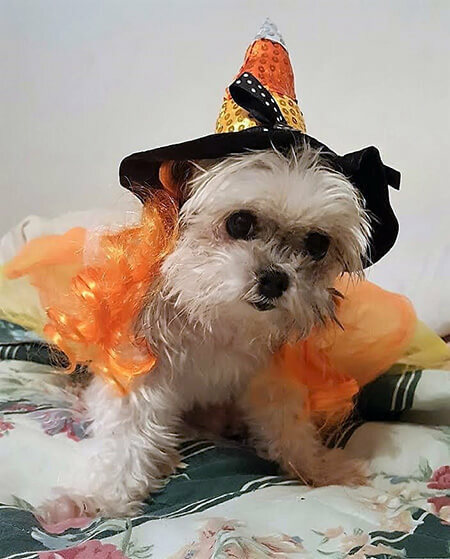 For the full details on costume safety for companion animals and other fun Halloween safety tips, watch the latest episode of Pet Talk! Before you go, be sure to check out our Trick or Treat episode from the archives for more spooktastic fun!